THE UNION OF STUDENTS in Ireland (USI) has launched a new campaign website, as it prepares to hold fifteen regional protest days ahead of this year’s budget. 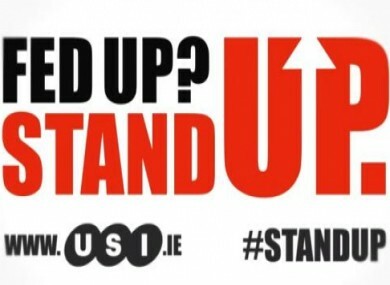 The site, www.usi.ie/standup, features information on the current cost of college and encourages students, parents and local businesses to read relevant information to them and then contact their local TD or Senator to voice their opposition to fee increases and grant cuts. Site users who choose to contact a public representative have the option to send a pre-prepared email and/or send a tweet to them with the hash tag #standup. The site also features a directory of upcoming campaign events and users can download a ‘Stand Up Toolkit’ which includes posters, a guide for parents on the cost of college, cover photos for social media and other resources to print or share online. Commenting on the launch of the campaign, USI President John Logue said the website is intended to motivate and mobilise people who stand to lose most from fee increases and grant cuts. Email “Student union launches campaign site targeting TDs and Senators”. Feedback on “Student union launches campaign site targeting TDs and Senators”.